It has needed to be repainted for a long, long time. But everytime I thought about it I got so overwhelmed that I pushed it out of my head. This past weekend my nesting instincts kicked in and I decided it needed to get done NOW before Baby Boy arrives. I’ve painted a lot of rooms in my time. In the house we’re in now I’ve painted the living room once already (the yellow color you see above), the kitchen twice, the master bedroom and another bedroom, plus miles of trim. 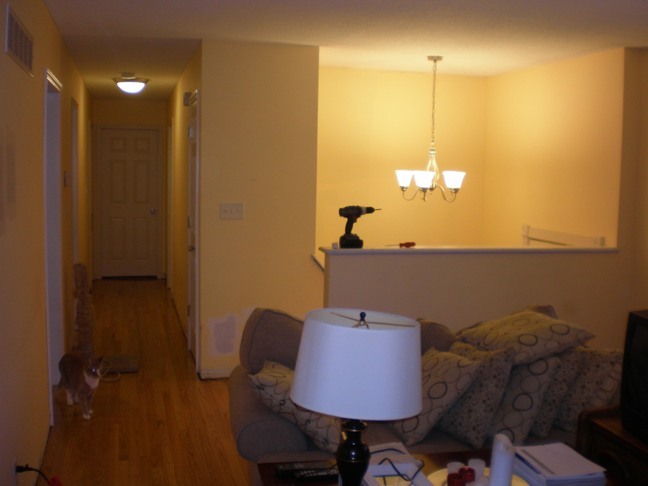 The people who lived here before us did a quick but terrible paint job on everything in order to get the house sold. So pretty much everything has needed to be repainted. Even though I’ve done a lot of DIY painting, I’m not an expert. So I’m not going to share a step-by-step account of how to paint a room. If you need instructions just Google “how to paint a room”. But I thought I would share some painting supplies that I always use when painting that I think makes the job go a little more smoothly. Paint can pourer (the yellow thing). I’m not sure what the technical term is for this item, but it fits on top of an open paint can so you can pour paint out easily and without making a mess. This item is a MUST for me! I love it. It keeps the rim of the paint can from getting all gunky. This contraption only costs a few dollars and you can wash it off and reuse it over and over so it’s definitely worth it. A plastic cup. When I’m cutting in a room (painting around the edges) I pour paint into a plastic cup and then carry that around with me to paint. It is much easier than lugging the can around, especially when cutting in up high near the ceiling. And I don’t like to wipe my paint brush on the edge of the paint can because it gets the edge all gunky. Paint. Obviously you need paint to paint a room. 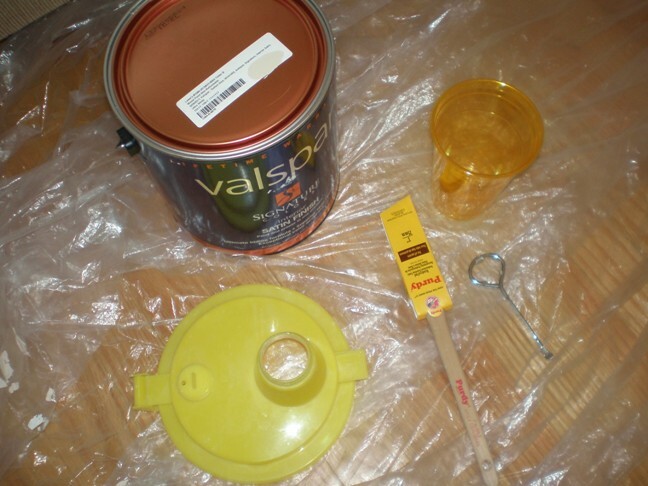 For this project I got the Valspar paint at Lowes. I have used it before and I like it. It goes on very smooth, though it’s as thick as frosting. Brands of paint might be a personal preference. The yellow color I am painting over was Behr paint from Home Depot. I actually hated that paint. It had all these bubbles in it and did not go on smooth. I also needed like 3 coats which is a pain. Of course my reasons for disliking it could be due to operator error. 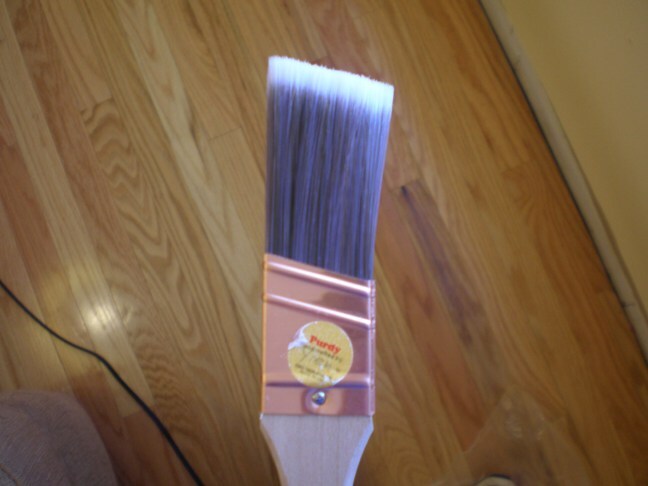 A sash brush has slanted bristles. Spend the money to get a good quality brush. It makes a big difference. Do not waste time or money on cheap brushes. This brush is Purdy brand and I really like it. I think it was $10-11. I have used it a lot already and the bristles are still as good as new. Paint goes on smooth and it is easy to wash out. Masking tape (not pictured). I really hate to tape and try to avoid it when I can. But if I have to tape I use plain old masking tape. It’s much cheaper than blue painter’s tape. The trick I’ve learned with taping is to remove the tape as soon as the paint is dry. Even if you are planning to do another coat, still remove the tape. If tape is left on too long it gets stuck to the wall or the trim and is really hard to remove. Then you have to get an exacto knife to get all the little pieces off and it’s a huge pain. So remove the tape as soon as you can and put new tape up when you do the second coat. I also use rollers, trays, stirs and drop cloths to paint, but there’s nothing special about them so I didn’t include them above. Other than that, that’s all you really need to paint a room. It’s pretty easy, it just takes time. I think anyone will tell you the worst part about painting is prepping the walls first. 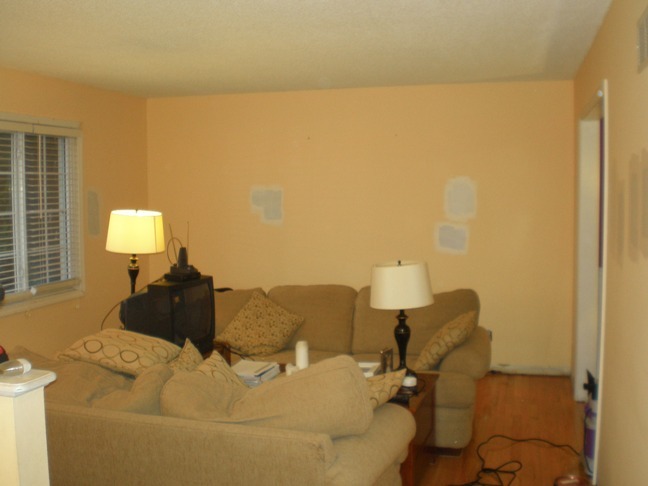 Sanding, spackling and cleaning can take awhile. I use it for cutting in instead of a brush and it eliminates the need to tape. I love that little thing.